Surprise! You just flew 6 hours on the plane to a chorus of coughing, your car is making a clunky gurgling noise, and “oh crap” you just dropped your $600 phone in the toilet. Sickness, unexpected repairs, and technology accidents happen. Without the proper reserves, these events can have a detrimental impact on your finances. You know that you need an emergency fund. (Check out 11 Reasons You Need an Emergency Fund) I hope that you have one! If not get started today! One way to build an emergency fund is to create a spending plan where you budget and save a small amount each month adding to your account. For some people gradually building their reserves will work, for others, it just takes too long. That's why I would like to introduce 5 ways to quickly build an emergency fund. Use any or all of these strategies to jumpstart your savings. If you have tried budgeting and cutting expenses but can't seem to grow your emergency fund fast enough, then maybe you need to try a new approach. Instead of shrinking your expenses, and slowly putting money towards your emergency fund, you can make more money with a side hustle to jump-start your savings. If you are looking for some side hustle ideas, check out our post 50+ Ways to Make More Money. One time odd jobs, like babysitting or handyman chores, can be a great way to stash some extra cash. For a longer-term side hustle, consider becoming a virtual assistant. No matter what path you choose, use your extra dough to quickly build your emergency fund without having to cut back on your lifestyle. According to the IRS, the average tax refund is $3,120! Instead of spending your tax refund on a vacation, big screen tv, or worse a downpayment on more debt (like a new car), use the money to protect yourself from future expenses. $3,000 is a lot of money and goes a long way towards growing your financial reserves. If you haven't filed your taxes yet, consider using an online tax preparer like E-File.com. E-File is an easy, fast, and accurate way to complete your taxes online. Did you get money back from Uncle Sam? If yes, use it to quickly build your emergency fund. Have you accumulated a bunch of crap that you don't use? Kill two birds with one stone. Sell your stuff to quickly fill your emergency fund and clean up your place at the same time. Selling items that you no longer use is both mentally and financially rewarding. You can always sell your stuff to other people on Amazon or eBay, but I never know how to price the items, and I find the auction process is time-consuming. If you have technology items to sell, check out Decluttr instead. Decluttr specializes in buying your used CDs, DVDs, and Games to help you make room and money! With Decluttr you can enter your items barcodes into their valuation engine and they will give you an instant offer. Then they provide the shipping label and after receiving the item they add cash to your account. Now you can clean up your place of old phones, games, and other tech items, while at the same time using your junk the strengthen your emergency fund. Woohoo! You have just received a much-deserved bonus for all your hard work! Time to buy a new car, take that trip you always wanted, and “treat yo' self”, right? Wrong! There is nothing wrong with buying a new car, trip, or other financial purchase, but not at the expense of an emergency fund. Resist the urge to celebrate your bonus by spending it. Instead, use it to quickly catch up your emergency fund. At a minimum, consider using the one-third rule. Save one-third of your after-tax bonus for your short-term goals, one-third for long-term goals, and the last third feel free to spend now. Take a no spend challenge. For one week or one month, don't spend any money on eating out, entertainment, clothes, toys, etc. Spend only on essentials, food, gas, and wifi. Then add the money you would have spent to swiftly build an emergency fund. To cut out unnecessary recurring expenses, check out Trim. 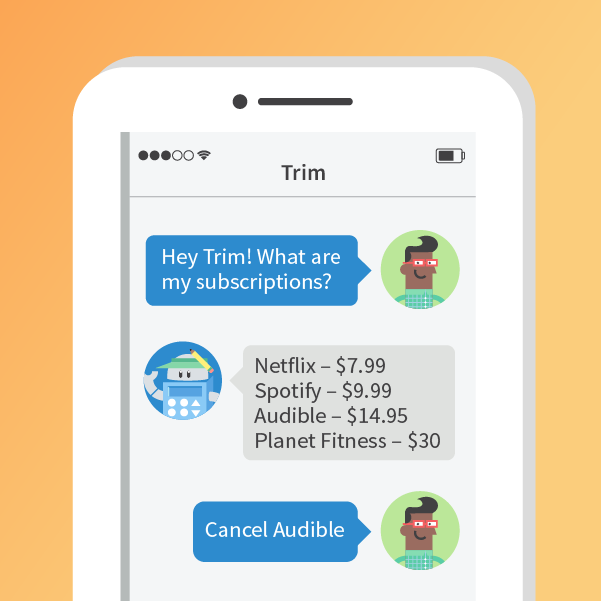 Trim is a personal assistant program that shows where you are spending your money, what your recurring monthly subscriptions are, and it can even negotiate lower rates for your cable and cell phone bills. You can read my review of Trim here. No spend challenges can be very difficult, but they can also change your life. It might help you to overcome a bad habit, like quitting smoking or drinking. Or you might just realize that you didn't need a particular expense in your life. If you don't have an emergency fund, what are you waiting for? The next surprise expense could really hurt! Don't wait! Start improving your reserves today. With adequate savings, you will enjoy peace of mind and thankfulness the next time your phone takes a bath in the toilet.